Why Cement tiles? In short, they are extremely durable (great for commercial and residential environments), slip resistant, aesthetically pleasing (you will say wow! ), and a green building product. Anything cement tiles cover becomes ART! 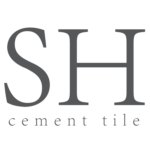 Also commonly called encaustic tile, hydraulically pressed tile, concrete tile, mosaicos, French tile, Belgian tile, Spanish tile, Moroccan tile, Cuban tile, Vietnamese tile, and Mexican tile.